While Bangkok features some of the most luxurious and elegant hotels in the world, the Thai capital is also renowned for being a haven for backpackers. Cheap hotels and hostels can be found in abundance, and attract young and budget-conscious travellers from all over the world. And, as our list of the Top 9 Bangkok hostels confirms… just because hostels are cheap, doesn’t mean they have to be dingy and dirty! The only downside to De Talak Hostel is its’ hard to find location down an alley, but once you get here the alley location means you’ll get a quieter night’s sleep, and the staff offer to collect you from the nearby metro station anyway. With good access to transport, and a short walk to an open all hours market this Bangkok hostel is a nice, reasonable option. Guests can make use of the hostel’s kitchen, fridge and washing machine which is great if you’ve been on the road for a while. They have 6-bed rooms as well as a double with ensuite for couples and even a family room with ensuite that accommodates four people. 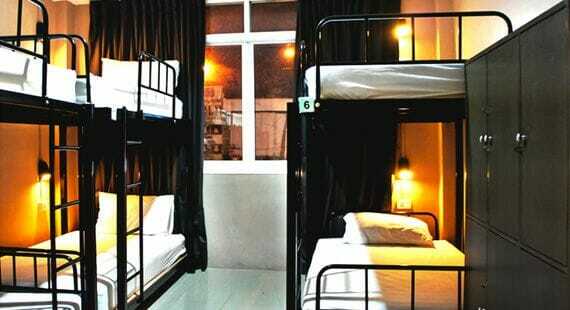 As Bangkok hostels go HQ Hostel Bangkok ticks all the right boxes – it is clean and affordable. The location might not be what you’d expect; it’s actually in the financial district though this does have some benefits because noise levels from outside are not usually a problem here so you should get a quieter night’s sleep. On the same block as the hostel you’ll find convenience stores like 7 Eleven where you can easily pick up drinks and food, and within walking distance are the bars of Soi 2 and Soi 4, plus one of the city’s markets. The Skytrain station is close by to get you all over the city, or reach Khao San Road with a short taxi or tuk tuk ride. Sunflower Place doesn’t feel like all the rest of Bangkok’s hostels; it has its own individual style and is more like a small guesthouse than a hostel thanks to its variety of private rooms. Even so, the reasonable price tag still says “hostel” as does the lack of common amenities, but when you’re looking for a cheap place to stay you won’t be expecting a long list of amenities anyway! It’s nice that all the rooms have a private bathroom – a feature you don’t often get in Bangkok hostels, and they all have balconies, air conditioning, TV, wifi and fridges, more great features you don’t normally get in hostels. Then there’s the location in Silom, with everything you need close by and easy to access. All in all, this is a great place to stay on a small budget. Think of Bangkok hostels and there’s no doubt that Khao San Road will spring to mind! NapPark Hostel is just off Khao San so if you’re looking for that lively backpacker atmosphere that this part of Bangkok is so famous for, this is a great place to stay. Now, put aside all those images in your head of a dingy hostel where no-one really wants to spend any time and instead picture a cool, boutique style place that’s chic, modern and inviting – you’ve just pictured NapPark! This hostel has some great features like power sockets by every bed, adjustable reading lamps, wifi and nice clean bathrooms. There’s a café, TV room, laundry, kitchen facilities, and of course the great location. Udee Bangkok Hostel is a little different – it’s located in a quieter neighbourhood of the city, about a 20 minute walk to the Skytrain. This gives the hostel an air of peace and quiet, helped by the beautiful little gardens outside that welcome you when you arrive. It’s definitely more of a peaceful destination that you might want to spend a little time in if you’ve been on the road for a while, especially their rooftop garden. They have a nice selection of rooms too, including several with ensuite bathrooms, or opt for the more hostel-like accommodation of a shared dorm room. A nice touch is the free coffee, tea and bread that they provide every morning, and there is a communal fridge and microwave for guests’ use. You will find cheaper Bangkok hostels than this one but you’ll be hard pushed to find one that is cleaner and offers a better service than Lub d. The location cannot be beaten, situated right next to the Skytrain station and three of the city’s best shopping malls: Siam Centre, Siam Discovery and Siam Paragon so this is a really central location close to everything. 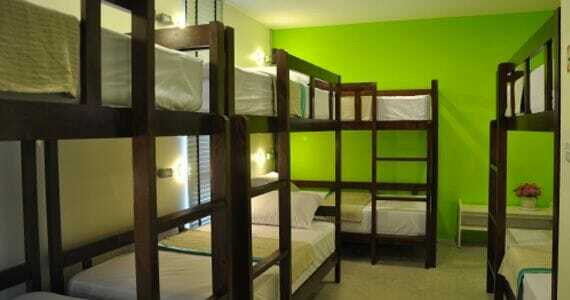 This hostel has five different room types, all of which are modern, bright and comfortable. From the dorm rooms to the Econo Twin and Econo Double, plus for a little extra money you can upgrade to a Double Deluxe that even has an ensuite bathroom. There’s also a little more here in terms of facilities – a bar, common area, courtyard and balcony provide plenty of spaces to hang out and make new friends, plus there’s a theatre room, free wifi and a laundry area. 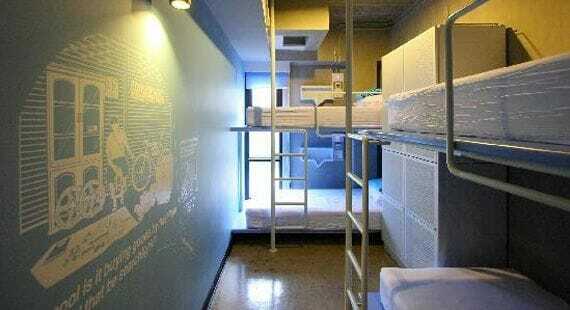 Number 3 on our list of the 9 best Bangkok hostels is Saphaipae Hostel. The good thing about this place is its size; reputed to be the largest hostel in Thailand it is set over four floors so it’s a great place to come for a real backpackers’ experience of getting to know your fellow travellers! Everything is modern, bright and clean, and the complimentary breakfast is a real treat. The location is very good too, central but safe feeling and just 5 minutes walk to the Skytrain and the river’s Saphan Taksin jetty. For the best affordability choose a dorm room or spend a little more and get a private twin, double or family room that includes an ensuite, safe, TV, mini bar and bottled water, all in the price. If you don’t upgrade to a private room you can still watch TV in one of their TV rooms with DVD rentals, plus there’s a pool table, coffee shop and even restaurant services. Link Corner Hostel is marketed as a Thai-Contemporary Hostel in the heart of Bangkok. It isn’t your typical Bangkok hostel – there’s an air of the chic and stylish about it, and compared to numbers 3 and 4 on our list, this place is a lot smaller and more cozy. The rooms are compact but the plus side is that you’re not sharing a dorm with loads of other travellers, and they do have private rooms too, some with ensuite bathrooms. Free wifi, a book exchange and travel guides, and use of the fridge and microwave are all good points, but it’s the location that gets this Bangkok hotel such high marks. Perfect for anyone just coming in to, or just leaving Bangkok, it is right by the Airport Link skytrain so you can be door to door in about 30 minutes and not have to worry about complicated directions and lost taxi drivers! And so to the number one hostel in Bangkok, Smile Society Boutique Hostel! When you stay a night at this hostel you will be smiling because it’s such a nice place. The fact that it says “boutique” in the name should give away the fact that this place is a little different to the norm – it’s a high class hostel, and it’s “green” so will appeal to all travellers who want to reduce their carbon footprint. 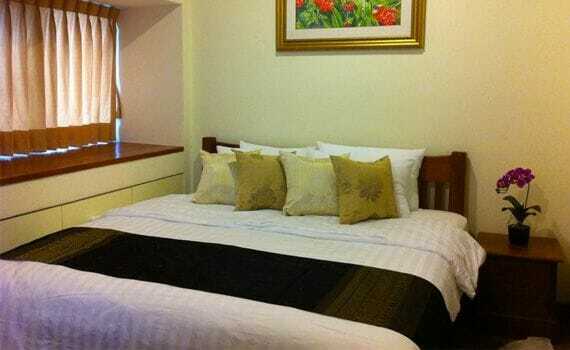 They offer nice dorm rooms and very nice private rooms that could rival many of the budget hotels in the city. Some have ensuite bathrooms and a TV, and more furniture than you might be used to with other hostels. A complimentary breakfast is also great to get you started each day, and the central location, just off Silom Road is convenient for the skytrain, shopping and restaurants. 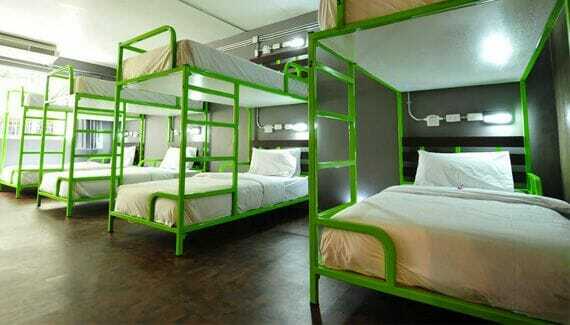 All these factors combined make this a worthy winner on our list of Bangkok hostels!